Aroma of fresh made waffles can make any morning special! 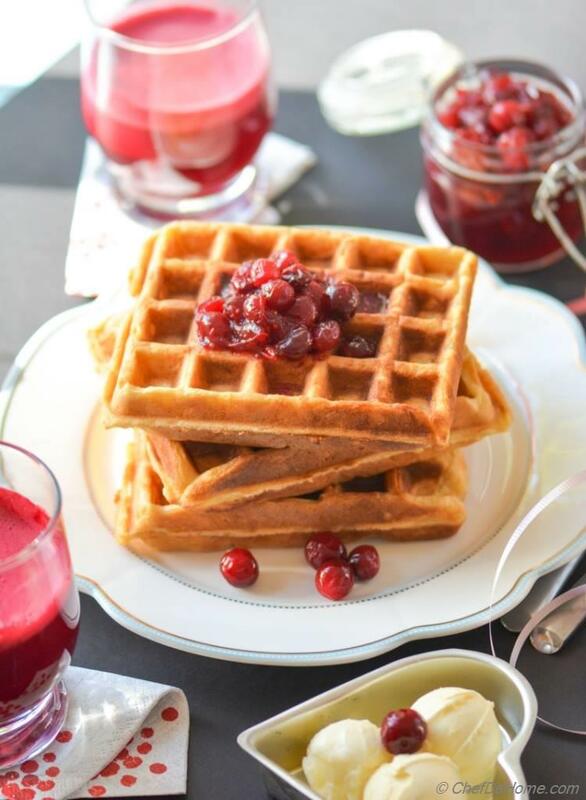 And if these waffles are ginger spiced sour cream waffles, topped with stewed cranberries, then this is certainly an extra special occasion! Valentine's day is coming on Saturday this year, I think... a delicious breakfast in bed will be an excellent way to treat a special someone! but seriously, a special breakfast, or I should say a "Waffle Breakfast", does not need a special occasion! Every day is perfect to say "I love you!" 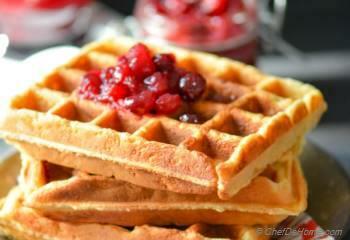 with a tray full of warm waffles, salted butter, syrup-y cranberries, and a glass of juice or hot coffee on the side. Kids, adults, or elderly, I haven't met a single person who does not like waffles in breakfast! These are WAFFLES, my friends! they can make any day special and anyone happy! Whole Wheat and Ginger, again!? Following the advice of my good friend, Mr. Alton Brown, I have added a good serving of whole wheat flour to these waffles. For two reasons, one to get some crusty exterior, and second for some whole wheat goodness. And ginger! you know! I'm so in love with ginger, specially during winters (a bit in summer too!) Can't help it guys, ginger and garlic are like heart and soul of Indian cuisine (for good reasons)! Day before yesterday, I was talking to you about merits of ginger. Don't worry, I 'm not going give that lecture again, but in one line, "in winters, ginger is your best friend!" Trust voice of Chef De Home! However, if you don't have ginger or your don't like ginger, you can use 1/2 tsp of cinnamon or cardamom powder too. 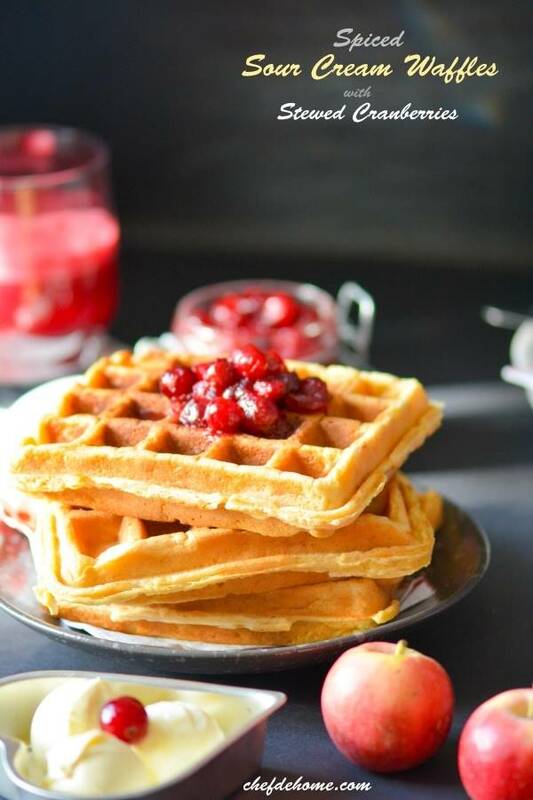 Glass of juice, smoothe, or a hot Chai Tea will be perfect with these waffles! Smart Swap Can't find cranberries? 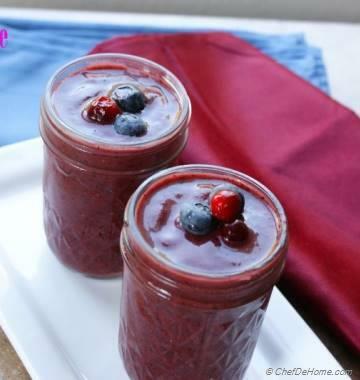 Strawberries or cherries also taste great when stewed! 1. 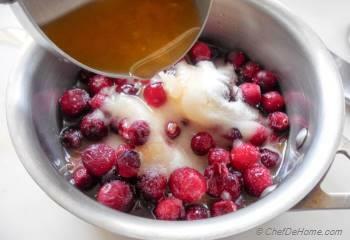 Stewed Cranberries - On medium heat. 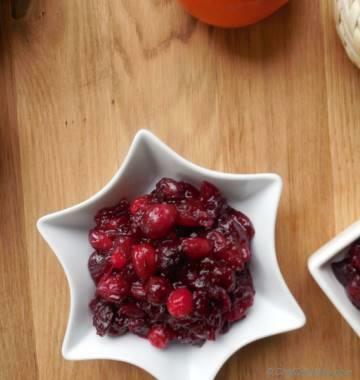 combine sugar, cranberries, and orange juice in a medium saucepan. 2. 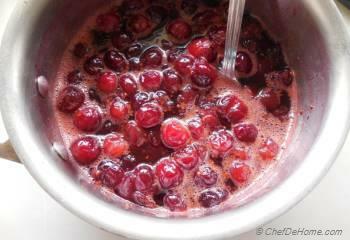 Cook stirring few times (gently) until cranberries release their juice and are just soft, but still holding shape. about 10 minutes. Once done, set aside. Yields about 1/2 cup, stays good for 1-2 weeks in an airtight container. 3. 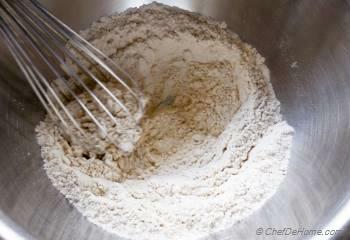 Waffle Dry Mix - Mix all dry ingredients, flour (wheat and all purpose), baking soda, baking powder, salt, and sugar in a wide bowl and sift to combine. You can make this batch and use any day when time pressed. 4. Mix all wet ingredients, sour cream, ginger juice, milk, eggs, vanilla, and butter in a bowl/jar and whisk to mix everything together. 5. 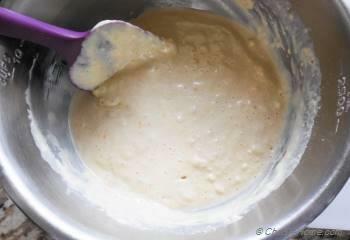 Pour wet ingredients into dry and gently mix just until combined, then set aside for 10 minutes. 6. In meantime pre-heat waffle iron. 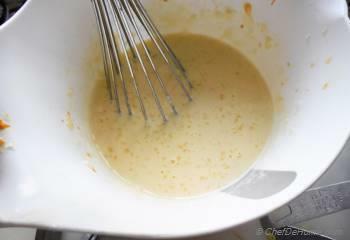 In hot waffle iron, brush butter or spray with oil, then add about 1/2 cup batter per waffle. 7. Cook 4 minutes or until steam stops emerging from cracks. 8. 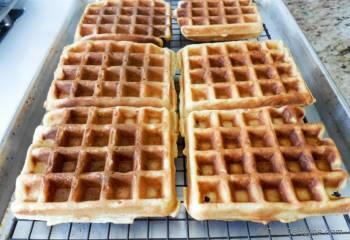 Repeat for rest of the batter, meanwhile place cooked waffles on a sheet tray lined with cooling rack. Don't stack waffles or otherwise steam of hot waffles will make each other soggy. If not serving immediately, you can also preheat oven at 250 degrees Fahrenheit and keep cooked waffles warm while cooking rest. 9. 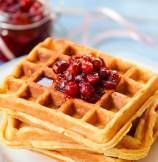 Pour some stewed cranberries on stack of waffles. I also serve salted butter on the side. enjoy! I often freeze a batch of waffles instead of serving store-bought version. To freeze, after making waffles, let'em come to room temperature, then pack in zip-lock bag and freeze for up to 6 months! To reheat, use toaster oven or heat an iron skillet and slightly toast both sides. Waffle Mix Make Ahead - To reduce the time to make breakfast, mix dry ingredient at night. Also make stewed cranberries at night. In morning, add wet ingredients, make waffles. 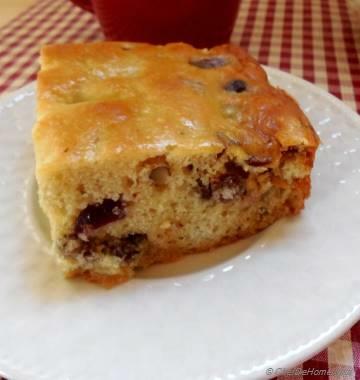 Serve hot with stewed cranberries and juice of your choice! Neeli, thanks for trying! I'm happy this waffle recipe worked out well for you! 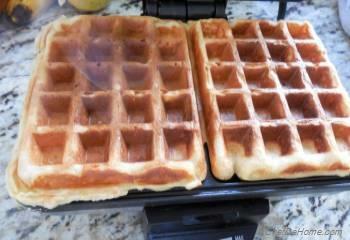 Savita, I tried these waffles yesterday, came out really good! I don't have cranberries, so I used some ready made strawberry syrup! loved the taste! I will make again! thank you so much, Padma! Tempting colourful waffles....just want to grab it...Lovely clicks!! Mira, thank you so much! I'm glad you like these waffles! Many thanks pin!! I love looking at these beautiful waffles, but now I have to make some! Delicious! Pinned! Oriana , thanks for stopping by! I am glad to connect with you! Savita... I'm so glad I found your blog!! So full of flavors and options. 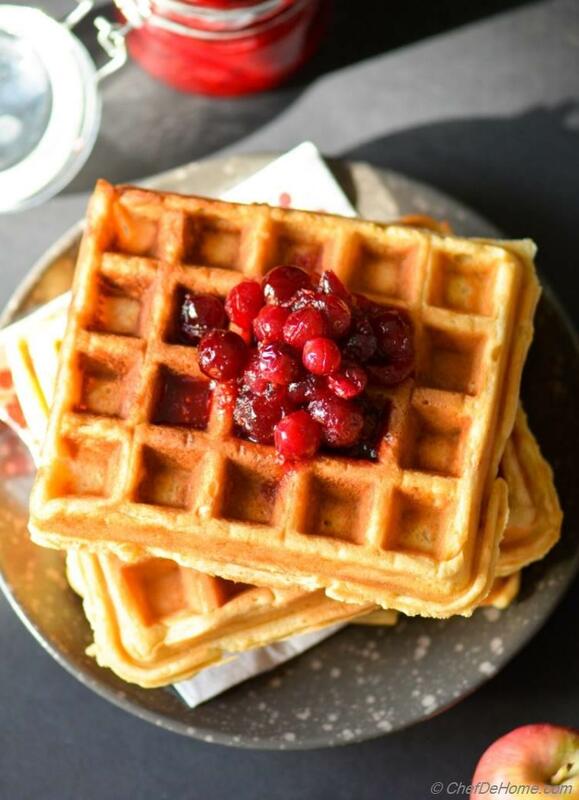 You have a new reader =) These wafles looks super good and the cranberries are the perfect final touch. Pinned! Ritu, we are on same page. Waffles for breakfast, always special! thank you so much for stopping by dear! Thank you, Gayle! Love to hear from you, thanks for stopping by! 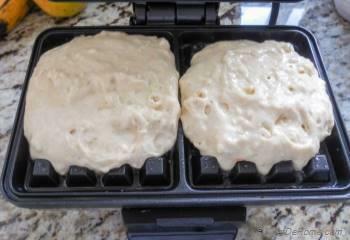 These waffles look fantastic, Savita! I absolutely love the stewed cranberries on top. So creative and the perfect touch! Manali, thank dear! I always love when you visit my site and many thanks for pin! Hey Gingi, thank you so much for stopping by! I would love to connect and visit your blog! Super Savita..these waffles will be perfect for Valentines day or any weekend for that matter! Love it..Pinned!